From left to right: Hannah Kamp, Lillie Kaempfe, Erika Mellor, Riley Petsch, Kayla Vogelsang, Jewell Kohler, and Kaitlin Mcginnitey. 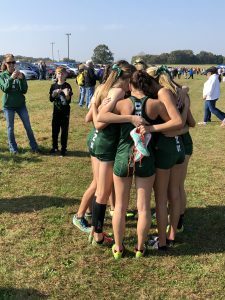 The girls cross country runners bond over their district win on Saturday, 10/27. The girls cross country runners pose with their coaches after earning their District Championship title. 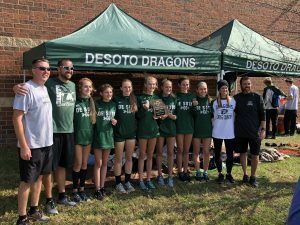 Congratulations to the girls cross country team! 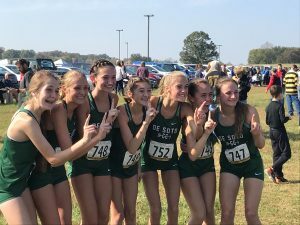 Our runners are the 2018 Class 3 Girls Cross Country District Champs! They will compete in the State Championship on Saturday at 9:35am at Oak Hills Golf Course in Jefferson City. Good luck, Dragons!